Intriguing portrait of one of the nation’s leading trial lawyers, and a fine brief on how a certain kind of law is done: slowly, thoroughly, and very expensively. Now in his mid-60s, David Boies made his first court appearance as a teenager contesting a speeding ticket. His impassioned arguments about what constituted “reasonable and proper speed” won him acquittal, but he was fined all the same for a broken taillight—“his first split decision,” comments legal journalist Donovan. Boies was diligent, intelligent, and apparently born without a sense of irony; his personal statement in his application to Yale Law School began, “I wish to be a lawyer, and the study of law is of course an essential means to this end.” He was so dedicated to his bosses that he paid little attention to life outside the office, which made things difficult for his family. 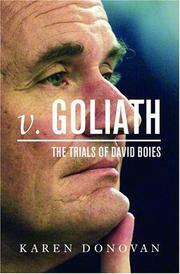 Even so, legal stardom came slowly, finally won when Boies was working as one of two dozen lawyers defending IBM over the course of a 13-year antitrust lawsuit and underscored when he represented the defendant in the complex, politically charged, and widely studied Westmoreland v. CBS, in which the American general sued the network for supposed libel. “One of the myths that grew, over the years, was that Westmoreland surrendered after Boies cross-examined him,” Donovan writes. “But it was . . . Westmoreland’s own lawyer who destroyed the general’s case.” As that passage suggests, the author doesn’t shy from Monday-morning quarterbacking here and there as she examines Boies’s celebrated cases, all characterized by his brilliant argumentation and hard work. Neither of which necessarily guarantees success, as the world learned while watching the legal storm that followed the 2000 presidential election, to which Boies contributed memorable arguments before the Florida bench on the business of indented chads and blocked recounts. Provocative and well told, offering comfort food to both those who believe that trial lawyers are leading the country to ruin and those who believe they are our salvation.